They say that the average lifespan of a restaurant is about five years, and it's probably less than that here in New York. So, it's no surprise that since I've been at one work location since 1998, that I've seen no less than seven restaurants change hands within a 2-block radius. 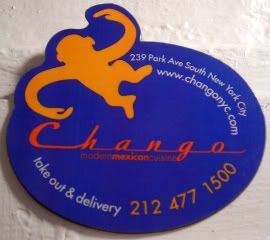 Here's another one that bit the dust a few years ago - Chango. Supercute on the inside, Mexican food was relatively good, and their margaritas were pretty good, too. Mmmmm. A margarita, or five, would be great right now.